Students aged 13 to 18 are eligible to apply for the summer exchange programs. AFS offers summer programs in more than a dozen countries. Summer exchange programs allow students to study in local schools and experience local cultures and languages in a short period of time. Program dates may vary and are subject to change. All summer program fees are not inclusive of air ticket fare. Information included in this program guide is meant to help with general planning and scheduling only. The intensive short program is designed for international students with English skills from beginner to intermediate. This program will allow participants to attend English classes and practice their speaking skills through exciting activities. There are three possible destinations for this program that all share a different perspective of the Canadian experience: Ottawa, ON, Halifax, NS, and Montreal, QC. This four weeks program provides an intensive teaching of the French language for international students, through both the formal classroom experience (80 hours total) and cultural activities. Participants will immerse in the language and lifestyle of Canada while living with a host family. Placements will be in various areas of Montreal, QC. 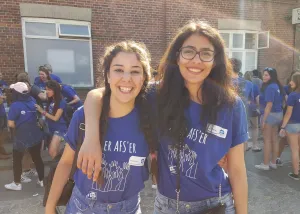 AFS and Ranum Efterskole College offers a four weeks summer school program. The students will become more confident in speaking and using English language. They will gain a good understanding of Danish history and culture. There is a weekly big excursion to an important cultural or tourist attraction. Take advantage to enjoy a unique experience of 24 hours sunlight in Finland during the summer intensive English language program. Participants will near the Helsinki metropolitan area with a local host family. Participants spend the first week with their host family while having opportunities to take part in attraction visits and cultural activities organized by AFS volunteers. For the latter two weeks of the program, students participate in English classes daily between Monday and Friday, for a total of 50 hours of teaching. An orientation camp takes place in Helsinki in the beginning and at the end of the program. This program offers lab time on STEM (Science, Technology, Engineering, Mathematics) subjects: e.g. building regenerative fuel cells, construction of bridges, robotics and visits to companies who work in STEM fields. The program offers excursions to Berlin and Cologne as well as free time outdoor activities. Participants will live in a group accommodation with full catering accompanied by camp counselors all the time. The camp takes place in Northern Germany, in the city of Bremen. The Intercultural Green Summer Session will contain an exciting workshop and excursion program around sustainability topics and resource protection. Students will experience the impact of global warming while visiting the “Klimahaus”, a museum on climate change. There will be an excursion to the German tidelands and the participants will get to know more about topics like sustainable energy and organic food. The program also includes city trips to Berlin and Hamburg. Participants will live in a group accommodation with full catering accompanied by camp counselors all the time. During a wonderful summer month in Hungary you will enjoy a week-long camp at the Hungarian Sea called Balaton. There are about a hundred youngsters with whom you can share nice memories. You will also experience our hospitality during your homestay weeks. This five-week program gives participants the full immersion experience of the Italian culture. It will begin with a week of language and cultural camp in Tuscany. At the end of the camp, the participants will travel to their host families where participants will join them in all their normal everyday life and activities. Participants will meet together again at the end of the program, for a three-days grand tour of Rome, including visits to the “Fori Imperiali”, the Coloseum, Vatican City, and St. Peter’s Cathedral, among other world-famous Roman sites. Participants will be placed in the families in Tokyo, Nagoya, Osaka, Fukuoka and Sapporo or their vicinity, and they will attend the Japanese Language course in the private language institution or high school from Monday to Friday. Participants will live with a local host family and have chances to explore the Japanese culture like art, food, and taking sight-seeing trips to nearby historic locations. This program fosters the development of personal, linguistic and intercultural skills. In addition to daily Spanish lessons (80 hours total), participants will have a chance to visit main attractions in Malaga City including the Picasso Museum, the Cathedral and more. Also, there will be day trips to Granada, Seville and Cordoba for deeper insight into the Spanish culture. The program takes place at the beautiful English boarding school in Kent. This short program is packed with language lessons, intercultural workshops, sports, leisure activities and day trips. Participants will have the opportunity to experience living and learning in an international community. Please note that participants aged between 15 and 16 should choose a program according to their language level. The Global Prep program in San Diego explores contemporary global issues and culture and at the same time provides an opportunity for increasing language proficiency for those who want to improve their English. Participants will be housed at the University of California, San Diego. Weekly themes include The Environment, and Contemporary Issues such as Immigration. These themes and the accompanying activities are designed specifically to increase competency, sensitivity and business knowledge in areas of global importance. Included in the program is a visit to Los Angeles, where participants get to spend a day at Disneyland and a full day touring of Hollywood, Grumman’s Chinese Theater, Santa Monica Pier, and much more!